Did a Neoliberal Energy Grab Backfire? Congressman Buck McKeon, Chairman of the House Armed Services Committee (HASC), is in charge of one of the most important committees in the Congress. In theory, the HASC is supposed to oversee the Pentagon via its investigatory and budgetary responsibilities. In theory, the HASC's job should be to protect both the soldiers at the pointy end of the spear and the taxpayers who are sacrificing their hard earned treasure. In practice the Chairman and most of the committee members are wholly-owned subsidiaries of the Pentagon and the defense industry — a self-interested faction in sense defined by James Madison in Federalist #10. In practice, the HASC, and its sister committees, overlook and pump the flow of taxpayer dollars to their allies and patrons in the Pentagon and the defense industry. So, while congressmen and senators wave the flag, asserting ad nauseum that supporting the troops and their combat readiness are their top priorities, the flow real money indicates this is rarely the case. In Versailles on the Potomac, the iron law of any policy analysis aimed at uncovering real priorities is - Follow the Money. 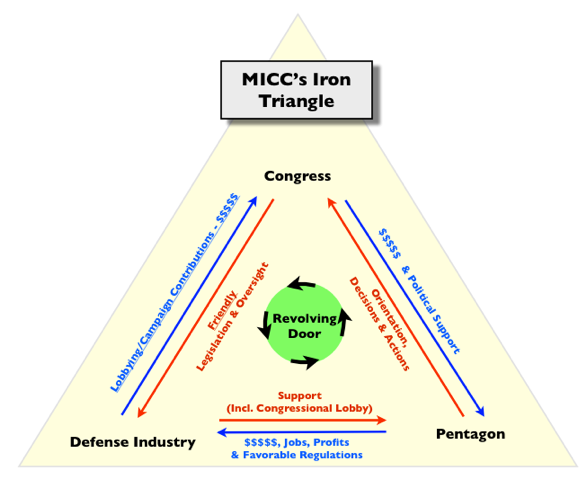 And the best way to begin any analysis of real budget priorities is to trace the flow of funds, patronage, and power around the iron triangle of the military - industrial - congressional complex, aka the MICC. The revolving door is a (the?) key lubricant to the money flowing around the triangle. The flow sets the incentive structure for the different players: congressmen and senators (their staff members) retire to become lobbyists and industry consultants or move to high level Pentagon jobs; ditto for civilian and military employees of the Defense Department (and they also move to congressional staffs); and members of the defense industry (as well as the panoply of defense oriented think tanks) move back and forth between the Pentagon and industry. The net result of this perpetual rotation is an upward spiral of personal enrichment, the enhancement of status and power, and most importantly, an industry-friendly defense budget. This “friendliness" manifests itself in continual pressure to shovel money to the modernization accounts (R&D & Procurement) and those contractor-friendly parts of the increasingly privatized Operations and Maintenance (O&M) budgets. In a decision-making milieu dominated by the Iron Triangle, real combat capabilities: force structure and highly trained, professional soldiers, airmen, and seamen are necessarily a lessor priority. The pressure to rob readiness to save modernization is present subtly during periods of increasing budget growth, but it becomes blatantly grotesque when the budget comes under pressure imposed by reduced rates of growth or cutbacks, as was the case in the early to mid 1970s, the early 1990s, and today. The legendary “hollow military” of President Jimmy Carter the late 1970s, for example, was the delayed result of the explicit decisions made during the Nixon administration to rob the the readiness accounts to protect the modernization accounts in 1973. My first report, Defense Facts of Life, produced during the late 70s, documented this result in detail using official DoD data. Today, the defense press is again dominated by reports describing the Pentagon’s need to cut force structure and the O&M personnel budgets. Which brings us to the A-10. The A-10, one of those rare low cost weapons whose effectiveness in real combat has far exceeded expectations, is rapidly becoming a poster child of the “rob readiness to protect modernization" mentality of the Iron Triangle. The DoD, the Air Force, and now HASC Chairman Buck Mckeon are determined to send the A-10 to the boneyard, in part because they want to save money by reducing a force structure. In this case that force structure component conveniently has an O&M budget with a low amount of contract services support. This cutback would have a minimal impact on the money flowing to contractors. The name of the game is to protect the money flowing to the contractors by sacrificing the A-10 as part of a larger strategy to save Procurement and R&D programs like the troubled F-35 or the more fanciful new long range bomber, which promises to make the F-35 look like an exercise in prudence. We saw how the slippery slope to a "hollow military” evolved insensibly out of seeming painless decisions in the early 1970s, and those, like Chairman Buck McKeon and Secretary Chuck Hagel, who ignore that history are condemned to repeat it. But they won’t be asked to pay the bill. Supporters of the A-10 "Warthog" close air support aircraft in Washington and US combat Soldiers and Marines who have seen, and are seeing, combat in Afghanistan were stunned Monday to read about a decision of the Chairman of the House Armed Services Committee, Congressman Buck McKeon (R-CA). He is joining with the Air Force and wants to retire all of these extraordinarily effective combat aircraft, sending them all to the boneyard at Davis-Monthan Air Force base, starting as soon as next year. Ever since Chief of Staff of the Air Force (CSAF) Mark Welsh decided to get rid of all of 300-plus A-10s in the active and reserve Air Force and the Air National Guard, the media and congressional hearings have been stuffed with information from combat veterans, pilots and defense specialists about how spectacularly the A-10 has been performing inAfghanistan and all other recent US wars in Libya, Iraq and Kosovo--going as far back as Operation Desert Storm in 1991. McKeon's A-10 sell-out comes in the form of a ruse. His draft legislation, to be moved Wednesday (May 7) at the mark-up of the House Armed Services Committee of its FY 2015 National Defense Authorization Act (NDAA), creates a distinction without a difference with CSAF Welsh's retirement plan. McKeon's own description of his handiwork says he "would limit funds . to retire A-10 aircraft unless each such retired aircraft is maintained in type-1000 storage [which]. means storage of a retired aircraft in a near-flyaway condition that allows for the aircraft to be recalled into use by the Regular or Reserve Components of the Department of the Air Force." Falling for the ruse either foolishly or knowingly, some media describe the language as "something of a compromise" or emphasize the "near fly-away" condition of the A-10 fleet after it is sent to the boneyard at Davis-Monthan. However, a simple check of what "type-1000 storage"means reveals that the aircraft will be made un-flyable and sealed in two layers of latex, which can be removed and the aircraft made operable only after considerable effort. However, the storage condition of the aircraft is not the real reason they will be unavailable. With the entire fleet to be sealed in latex, there will be no A-10s flying to maintain a cadre of qualified pilots and maintainers. That cadre is to be disbursed throughout the Air Force or retired. Without ongoing training and combat operations, their skills will erode to the point of evaporation. It is not just the extraordinary characteristics of the A-10 itself that make it such a lethal system; it is the hard earned skill levels-very unique for the close air support mission-of the pilots, maintenance personnel and ground controllers. The Aerospace Maintenance and Regeneration Group at Davis-Monthan may be able to prepare the A-10s for flight operations in a few weeks, but there will be no one to fly and maintain them, nor the cadre of ground combat operators who best know how to use the unique A-10. Those skill levels will take months, rather years, to restore to the level that they are at today. Some have immediately seen through McKeon's ruse; note the comments of Senators Ayotte, McCain, Graham and Chambliss in a press release of Tuesday May 6; note their acknowledgement that "Units will be stood-down, training will no longer occur, and crews will be re-assigned." McKeon's decision to entertain such a phony compromise comes as a surprise. While McKeon has won himself a reputation with objective observers for primarily being a play-thing of the defense manufacturers due to his being so much on the take for their political contributions (as shown by his file at OpenSecrets.org), such politicians are usually also willing to show how stoutly they "support the troops" by funding weapons in use-and effective-in combat. McKeon would seem to have evolved to a different calling: he is retiring at the end of the current Congress; he continues to litter his nest with campaign contributions; he apparently is "over" supporting the troops with weapons that work. There is no shortage of money for keeping the A-10. That is clear in the draft NDAA that McKeon is recommending to the House Armed Services Committee. McKeon compiled a list of 28 programs that he added money for in the bill. It all costs an extra $5.8 billion, and the $400-$600 million needed to preserve the entire A-10 fleet in 2015 would only have ranked fifth or sixth in size of the programs he added-including $796 million for refueling a nuclear-powered aircraft carrier and $800 million for an amphibious warfare ship, both of which the Navy did not select to fund. To pay for his $5.8 billion in add-ons, McKeon found a commensurate amount of offsets to keep the overall bill at the level required by the Budget Control Act of 2011 and subsequent congressional budget deals. McKeon did not even tap the huge amount requested to fund the F-35 Joint Strike Fighter ($8.3 billion), and he even set up another huge slush fund-not yet tapped-in the form of $6.2 billion for procurement and $64.7 billion for operation and maintenance in a $79.4 billion fund-as yet neither specified nor even formally requested by the Obama administration-for operationsostensibly for the war in Afghanistan. Known as the Overseas Contingency Operations account, this $79.4 billion fund is just a placeholder amount based on the funding requested for 2014; it is still pending a decision in the Pentagon on what will actually be needed for the significantly reduced American presence in Afghanistan in 2015. Nonetheless, McKeon wants to keep it at the inflated $79.4 billion level-with no telling what other programs he will shower with the excess funds. The final irony-to put it politely-comes with Buck McKeon's assertions about the war in Afghanistan, itself. In his fact sheet on his version of the NDAA, he exhorts the Obama administration to keep a robust number of troops in the conflict there, saying the "mission cannot be carried out with fewer than 10,000 U.S. troops." With his A-10 sell-out effected, those troops will not have the lethality against the enemy they can only have with the A-10. Buck McKeon is not just selling out the A-10; he is selling out those American forces in Afghanistan-and possibly elsewhere-in the future that will not have the A-10 to support them.